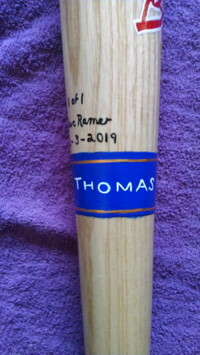 This Legends Hand Painted Isaiah Thomas Bat features my original paintings of the Detroit Pistons Star. 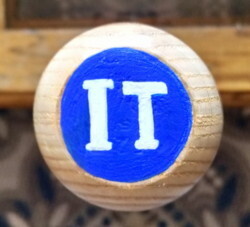 This Bat Has Been Sold. Order A Similar Bat Below. Below Thomas' portrait is my hand painted NBA CHAMPS gold shield and scroll with 1989-190. Also my hand painted "BAD BOYS". 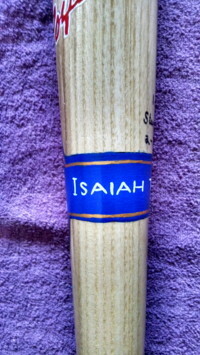 The "ring" around the bat has Isaiah's number 11 and his name. 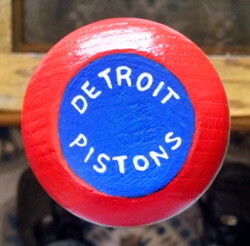 The top of the bat has my painted Detroit Pistons. The knob has Isaiah Thomas' initials. 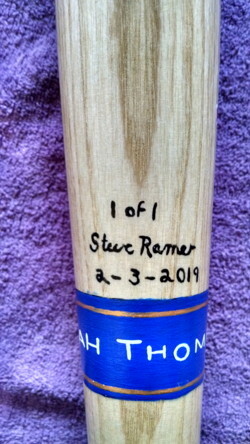 You'll also see my signature and date this bat was completed. Also 1 of 1. This is a one of a kind item. This is a genuine, full sized, 34 inch Rawlings wooden baseball bat. 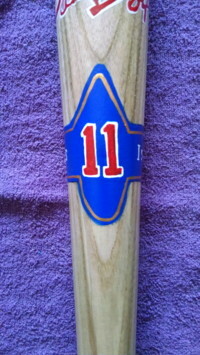 Contact Me To Order A Similar Bat. Please Allow 4 Weeks For Completion Of Your Bat.